The Chicago Sun-Times is serving up politics, deep dish style. Early & Often is the paper's brand new website for all things Chicago, Springfield and Washington politics. It includes traditional news stories but also video stories, a data-portal, aggregated content, opinion pieces and event coverage and listings--all in one place. 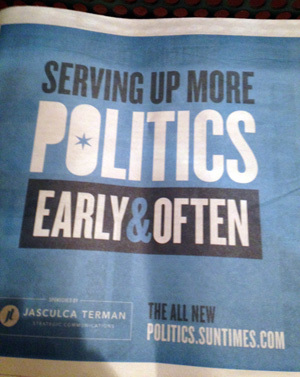 "We are confident you'll find Early & Often to be the most comprehensive look at the local political scene," wrote Jim Kirk, Sun-Times publisher and editor-in-chief, to readers in yesterday's paper. Early & Often hosted its kickoff event yesterday--"Youth in Politics with David Axelrod," held at the University of Chicago Gleacher Center. Axelrod addressed a number of topics, including social media in campaigns, saying that technology today will probably be obsolete by 2016, to gubernatorial candidates and Rahm Emanuel. Will someone run against Rahm next year? Axelrod said that Rahm will take any challenger seriously. "He loves the city. I think he's going to fight very hard to keep that job." The audience, made up mostly of high school students, was encouraged to ask Axelrod questions using #EOAxelrod. One guest asked about Harold Washington. Axelrod worked as a Tribune reporter during Washington's campaign. "Harold was about inclusion. Everyone needs to be a full citizen here in Chicago, full participant," said Axelrod. He explained that the Barack Obama logo used in the 2008 campaign was influenced by a blue and white pin that Harold Washington supporters wore in the 80s. Axelrod said they were badges of pride. Another student asked how best to get involved in politics while still in school. He answered that it's best to get involved in small campaigns and to learn as much as you can from them. Early & Often plans to host monthly live events like these to connect readers with the top newsmakers and leaders on important topics.